THIS BILL WAS NARROWLY DEFEATED BY THE ELECTORATE OF MASSACHUSETTS ON 11-06-12. I BELIEVE IT WILL BE SEEN ON THE BALLOT AGAIN IN THE FUTURE. It’s not often that voters face a moral question like the one expected on November’s ballot: Should terminally ill patients have the right to get a fatal prescription? It’s up to the people of Massachusetts. In the fall of 2010, Lee Fronk Johnson and his wife, Mary Lou, set off on a long-awaited trip abroad, with planned visits to Prague and Budapest and a weeklong cruise down the Danube. On October 12, the Johnsons, of Portland, Oregon, stopped over in Reading, where their oldest daughter, Heather Clish, lives with her family. They expected to stay one night. But when Lee Johnson arrived at his daughter’s house, he was not himself. Johnson, who was 65, would go to sit in a chair, miss it, and fall to the ground. He would say he was going downstairs to the basement but walk up to the second floor. “It was very clear that something was wrong,” Clish says. Clish, her husband, and Clish’s mother came to an unavoidable conclusion: Johnson was in no condition for an overseas adventure. He initially resisted their assessment. “I can push through,” he said. But he realized they were right. The Johnsons called off their trip. Instead of heading to Logan International Airport, Mary Lou drove her husband to Massachusetts General Hospital. An emergency room evaluation, CAT scan, and subsequent biopsy revealed tragic news. He had terminal, inoperable brain cancer, the same kind that had killed Senator Ted Kennedy a year earlier. Before coming to Boston, the Johnsons had known something was amiss — indeed, Mary Lou had stopped riding in the car with her husband because he’d been running red lights. He had tried to downplay it, tried to will himself to Europe. Now he was facing the final chapter of his life. Heather Clish, of Reading, is a proponent of the Death with Dignity Act. Her father used Oregon’s law to take his own life peacefully. Not long after the diagnosis, Johnson said he needed to return to Oregon. He knew his home state granted terminally ill patients the choice to end their lives with a lethal prescription. Johnson had grown up in a large, poor family in Utah, fleeing chaos at home from age 13 to work summers on Wyoming ranches. He retired at 55 after a career with the federal government, then took up woodworking. And so Johnson and his wife, after about two months of treatment in Boston, went home just before Christmas. He submitted to another round of chemotherapy. His family took him on a final trip to Cannon Beach, on the Oregon coast. They arranged for palliative care. Mary Lou got him out of the house as regularly as she could. Amid all this, Johnson, after completing a series of steps required under Oregon law, acquired a lethal dose of Seconal, a barbiturate. By March of last year, Johnson’s condition was rapidly worsening. He had fallen. His mobility was increasingly limited. He was in pain. On Thursday, March 17, he called Clish and said it was time. She flew out. He tried one final treatment. His wife took him for a last Heath Bar Blizzard at Dairy Queen. They arranged for hospice care. And then, on the evening of Monday, March 21, Johnson decided he was ready to go. The family gathered. They shared memories and traded jokes. “He was like, ‘Hey, isn’t anybody going to at least bring some flowers in here?’ ” Clish says. “So we got some flowers.” Clish pulled up US Geological Survey maps on her laptop to make sure she understood exactly in which Utah canyon he wanted his ashes spread. They played Emmylou Harris, one of his favorite artists. They served him toasted Haystack Bread, from a Cannon Beach bakery, topped with his wife’s homemade raspberry jam. Around 8:30 that night, after everyone had said their goodbyes, he drank the Seconal solution from one of his favorite Scotch glasses. Clish and her two sisters filled his ears with pleasant images. Mary Lou lay in his arms, as he’d wanted. He had earlier told her, “I hope I will be holding you when I take my last breath.” Johnson slipped into what looked like a deep sleep. After about 15 minutes, his pulse stopped. A year later, Heather Clish has become a leading advocate for affording terminally ill patients in Massachusetts the same choice her father had. Clish and other supporters are pushing a ballot initiative to legalize the practice they call Death with Dignity, more commonly known as physician-assisted suicide. Voters will almost certainly decide at the polls this November whether it should be allowed here, as in Oregon and Washington, the only two states where voters have explicitly authorized it. Under the Massachusetts proposal, which is virtually identical to the laws in Oregon and Washington, terminally ill, mentally competent adults deemed to have six months or less to live would have the freedom to obtain a fatal prescription. They could qualify only after going through a process designed to ensure that they are not being coerced and that they fully understand what they’re doing. They would administer the drugs themselves. Any doctor opposed to the practice could opt out of writing the prescription. Massachusetts has had its share of contentious ballot questions, but few, if any, have played to the conscience the way this one promises to. It is sure to generate vigorous discussion even in an election cycle dominated by a presidential contest and a competitive US Senate race. As Clish’s story illustrates, the debate is animated by personal experience, with people on all sides weighing the proposal’s merits through their own prisms — their work as doctors, nurses, and caregivers, the suffering and death of loved ones, and anxieties about what their own final days will look like. For proponents of assisted suicide, Massachusetts, as a socially progressive, prominent East Coast state, represents the next frontier. It poses a major test for a movement that has had difficulty gaining traction beyond the Pacific Northwest. Supporters face a challenge in part because Massachusetts is among the most Catholic states in the country, and the Church has long opposed the practice. Indeed, the ballot initiative would also test the Catholic Church’s influence. Church leaders in Massachusetts have already begun a campaign to defeat it. Ultimately, it will be up to voters to weigh competing opinions, reflect on their own beliefs, and resolve thorny ethical questions: Do the potential benefits for terminally ill patients and their families outweigh the risks of abuse and misdiagnoses? And, as is asked in the debate over abortion, should people be at liberty to make such a choice on their own, or can civil society claim a moral stake in their private medical decisions? Physician aided dying has been debated in the United States and internationally for more than a century, resulting in numerous attempts to sanction various practices. Most have failed. Then, in 1994, Oregon voters narrowly approved a ballot initiative granting eligible patients the authority, under strict conditions, to obtain a lethal prescription. Legal challenges to the Oregon law held it in limbo until 1997, when the US Supreme Court affirmed that state’s right to enact it, and voters there resoundingly rejected a repeal effort. (The Supreme Court reaffirmed the law in 2006.) In 2008, Washington state voters followed suit, approving a virtually identical ballot initiative, which took effect in March 2009. A 2009 state court decision in Montana seemed to open the door to assisted suicide in that state, though that remains in dispute. Ballot campaigns elsewhere have failed, however, including a close vote in Maine. In fact, New England has proved to be inhospitable territory for efforts to legalize assisted suicide. Legislative attempts have stalled in New Hampshire and Massachusetts. Lawmakers in Vermont, who appeared close to enacting an assisted-suicide law earlier this year, have since backed away. So what do we know about the experiences of Oregon and Washington? Quite a bit, it turns out, because the states collect a good deal of information about the people who have sought the prescription. One of the surprises has been how many patients acquire the drugs but don’t end up using them. In Oregon, 935 people had received lethal prescriptions through 2011, and 596 of them died from ingesting it. The rest either chose not to take it or died of their illness before they could. The number of people taking advantage of the law has climbed steadily over the past 15 years; in 2011, 114 people received the prescription and 71 died from it, the highest tallies to date. Men and women have used it at roughly the same rate, and their biggest end-of-life concerns have been losing autonomy and dignity, according to doctors’ reports. Most recipients have been suffering from cancer. The patterns so far in Washington resemble Oregon’s. In 2009 and 2010, 152 people received a prescription, and at least 87 died from it. Most suffered from cancer. As in Oregon, those with the highest education levels were most likely to obtain the prescription. Death with Dignity advocates say the laws are working as intended. A relatively small number of people, they say, have voluntarily, humanely, and peacefully ended their suffering. “I would say the greatest teaching from Oregon is that so many fears — legitimate fears, fears about patient safety, end-of-life care — have been allayed,” says Barbara Coombs Lee, the president of Compassion & Choices, a Denver-based organization that advocates for such laws and helps patients who use them. Even some personally opposed to assisted suicide agree Oregon has proved many of the concerns to be overblown. “When all things are considered, the arguments in favor of continued prohibition of physician-assisted suicide are not particularly compelling,” Daniel E. Lee, an ethicist and professor at Augustana College in Rock Island, Illinois, wrote in a 2003 essay for theHastings Center Report, a prominent ethics journal. Lee (no relation to Barbara Coombs Lee) wrote that it’s perfectly appropriate to maintain moral reservations, as he does. But he said that was not enough to “stand in the way” of those who want to make a different choice. Opponents of the Massachusetts ballot initiative point to a handful of cases where they say the safeguards haven’t worked. One is the story of Kate Cheney, an 85-year-old Portland, Oregon, woman suffering from stomach cancer whose request for a fatal prescription was initially denied after a psychiatrist questioned her mental capacity. Cheney then got a second opinion, ultimately won approval to obtain the prescription, and ingested it in August 1999. To opponents, her case raises troubling questions about whether her family and her health maintenance organization, both of which backed her decision, exerted undue influence. In the end, the Oregon Health Plan’s reluctance to pay for the drug proved to have merit. Wagner received Tarceva free from a pharmaceutical company but died a few months later. Still, the Oregon Health Plan, though it continued covering lethal prescriptions, stopped sending such letters. And then there’s Jeanette Hall of King City, Oregon, who voted for the Death with Dignity Act at the polls. In 2000, Hall was diagnosed with cancer and inquired about assisted suicide. She thought about refusing treatment. Her doctor encouraged her not to give up. So she didn’t. Twelve years later, she is still alive. Her experience informs her belief that Massachusetts ought not follow Oregon’s lead. Indeed, if there’s one overriding concern shared by opponents of the ballot initiative, Hall’s story illuminates it: a fear that doctors will make errant prognoses, leading patients to end their lives when they may have many months, or years, left. It’s moments like these that O’Hara-Rusckowski fears other families will miss out on if physician-assisted suicide becomes legal. Maybe her mother would have never chosen that option, but what if she had? Some doctors who oppose assisted suicide also believe it’s a perversion of their mission, which is to heal and not harm. “I really see it as being the corruption of medicine,” says Dr. Mark Rollo, a longtime family physician in Fitchburg who is part of a coalition opposing the ballot question. Dr. Marcia Angell, of Cambridge, isn’t so sure. A pathologist by training, Angell was the first woman to serve as editor in chief of the prestigious New England Journal of Medicine. She’s now a senior lecturer in social medicine at Harvard Medical School and a leading advocate for the Death with Dignity ballot initiative. Doctors can’t always alleviate suffering for the dying, she says, and patients should have the option to end it themselves. That, she argues, is consistent with the greatest obligation of doctors — to care for people as best they can, in accordance with their wishes. Besides, Angell argues, top-flight end-of-life care and the choice of taking a lethal drug can coexist. “Good comfort care and the availability of physician-assisted suicide are no more mutually exclusive than good cardiologic care and the availability of heart transplantation,” Angell wrote in a 1997 Journal editorial. In fact, studies suggest that Oregon’s Death with Dignity Act has only improved end-of-life care in the state. Coombs Lee's analogy raises a fundamental question: If someone is near death and hastens it with a prescription, is it truly suicide? This is why some Death with Dignity advocates bristle at using the word “suicide” at all. The debate extends to the letter of the law. Under the Massachusetts proposal, as in Oregon and Washington, the death certificates of those who use the law would list their underlying illness, not suicide, as the cause of death. What’s more, is ingesting a lethal prescription morally distinct from removing a ventilator or a feeding tube? Terminally ill patients and their proxies make those decisions every day. Cardinal Sean P. O’Malley of the Archdiocese of Boston said in 2000 that assisted suicide was “not an expression of compassion, it is a flight from compassion.” Then the bishop of the Fall River Diocese, he wrote in a pastoral letter: “Like many facile solutions, it is immoral. What passes for mercy is really an act of isolation and abandonment.” O’Malley echoed those sentiments in September 2011 in a homily at an annual Mass for Massachusetts lawyers and jurists. In addition to making a spiritual case against the ballot question to parishioners, church leaders intend to work with a broad coalition of organizations to turn the Massachusetts electorate against the measure, relying on the more secular argument that it would be bad for our shared humanity. One major task of that group, as for the advocates on the other side, will be raising money. Sustaining a media blitz in the fall, a critical component of swaying public opinion, will not be cheap. Marcia Angell is sure her father, had the option been available to him, would have made the same decision. In the 1980s, Lester Angell, who lived outside Orlando, developed prostate cancer, which metastasized and caused him great pain. He underwent treatment and made it through a few years. Then on March 14, 1988, at age 81, he fell as he tried to enter his bedroom. His wife couldn’t lift him, so she called the EMTs, who helped him into bed. The EMTs planned to return in the morning and bring him to the hospital for evaluation. 1) An adult patient is diagnosed with a terminal illness and determined to have six months or less to live. 2) The patient asks his or her doctor for a lethal prescription. The doctor is required to discuss other end-of-life care options, including palliative care and hospice, and to assess the patient’s mental competence before moving to the next step. If the doctor has moral qualms, the doctor can, but does not have to, refer the patient to another physician for the prescription. 3) A second doctor must confirm the initial diagnosis and prognosis, verify that the patient is mentally competent, and affirm that the patient is seeking the prescription voluntarily. 4) Once the two doctors have reviewed the patient’s medical condition and mental competence, the patient makes a written request for the prescription. The request has to be witnessed by two people, including one who is not a relative, entitled to a portion of the patient’s estate, or an owner, operator, or employee of the patient’s health care facility. It must be made at least 48 hours before receiving the prescription. 5) The patient must reiterate his or her oral request after at least 15 days, at which point the doctor is required to offer the patient the option of rescinding the request. The patient receives the prescription. 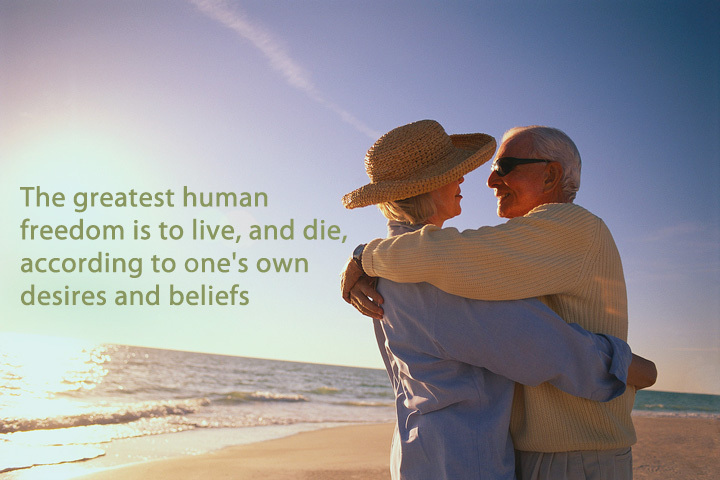 I care about supporting your end of life decisions. I do believe in death with dignity.